I was the first to become vegetarian since we came to India. The first year of the Nyingma Monlam in Bodh Gaya was non-vegetarian. In the second year I came there and spoke at a meeting of all the high Nyingma Lamas. I told them that Bodh Gaya is a very special place which is holy to all Buddhists, and if we say we are gathered here for the Nyingma Monlam and yet eat meat, this is a disgrace and the greatest insult to Buddhism. I said they should all give up meat from now on, during the Nyingma Monlam. Even the Tibetan lamas and monks eat meat! What a shame if even the lamas can’t give up meat! First the lamas should commit themselves to being life-long vegetarians. If the Lamas become vegetarian, and then you can address the lay people. Then also you should urge the monks to become vegetarian. Otherwise if knowledgeable religious people eat meat, how can one expect the ignorant public, who follow along just like sheep, to become vegetarian? Earlier in the Sakyapas, Sachen Kunga Nyingpo abstained from meat and alcohol. From then on gradually in the Nyingmapas there was Ngari Pandita Pema Wangyal, an emanation of King Trisong Detsen. He was a vegetarian all his life. 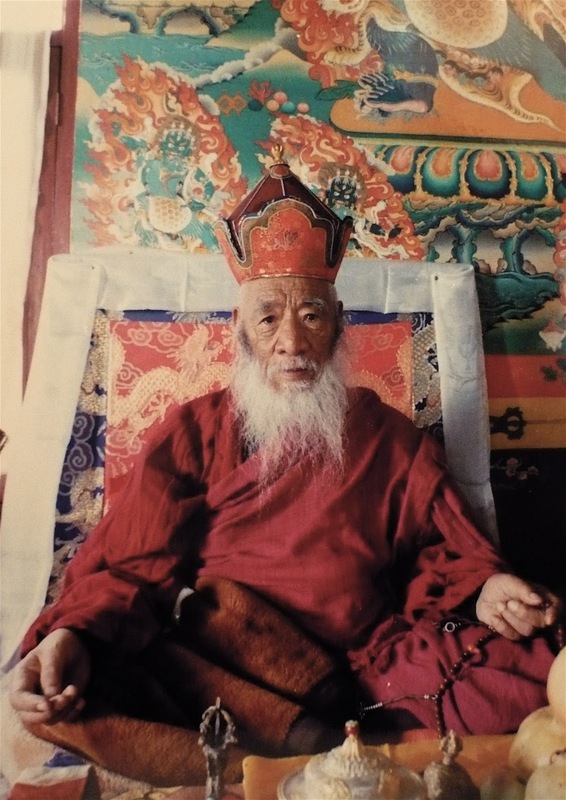 Also the non-sectarian Lama Zhabkar Tsogdrug Rangdrol: he was born in Amdo and was a heavy meat-eater, but when he went to Lhasa and saw the many animals being slaughtered in the butchers’ district of Lhasa, he became vegetarian for the rest of his life. Many of his disciples also became vegetarian. Many others – Sakyapas, Gelugpas, Kagyudpas and Nyingmapas – have done like this and become vegetarian. In Kongpo, Gotsang Natsog Rangdrol told his monks to abstain from meat and alcohol. Because the Kongpo Tsele Gon monks wouldn’t obey his orders, he became angry with them and went to Gotsang Phug in lower Kongpo, and stayed there in isolated retreat for 20-30 years. Abstaining from non-virtuous actions such as eating meat and drinking alcohol, he attained realization and became known as Gotsang Natsog Rangdrol, a highly qualified teacher. Similarly, Nyagla Pema Dudul abstained from meat and alcohol. He meditated in isolated hermitages for 20-30 years, not relying on people’s food but rather nourishing himself on the essence of rocks and earth, and attained rainbow body. He is known as “Pema Dudul who attained rainbow body.” He lived at the time of Nyagke Gonpo Namgyal. It happened like that. When I was in Bhutan, sometimes meat would be served during big ceremonies or pujas for dead people. This killing of animals for the dead person is an obstacle for the spiritual evolution of the dead and an impediment on the path to liberation. It is of no benefit to the dead person. The people in the Himalayan region are all Buddhist. Some of the Tamang and Sherpa lamas are ignorant. Because they want to eat meat and drink alcohol, they say that it is necessary since they are followers of Guru Rinpoche, who ate meat and drank alcohol. But Guru Rinpoche was born miraculously, not like those Lamas who were born from human parents. Guru Rinpoche is known as the Second Buddha. The teacher of the Sutras is Shakyamuni and the teacher of the tantras is the omniscient Guru Rinpoche, who prophesied exactly what will happen in the future. Abstaining from meat is a means of attaining world peace. I have given up meat, and I also don’t eat cake since it contains eggs. Eating meat and eating eggs is the same. An egg will hatch into a chicken. A chicken is a sentient being. For example, there is no difference between killing the unborn fetus in a pregnant woman and killing the child after it is born; the killing is the same negative action. This is the reason why I don’t eat eggs. Your work is not useless – it is very useful. This message is not just for Buddhist; everyone who thinks and reasons can understand it. Especially all the learned scientists and doctors should think about this: are smoking and meat-eating beneficial? As an indication of this, who has a longer life span, smokers or non-smokers? Who has more illnesses, smokers or non-smokers? You university students can think about all the reasons and figure it out. I only speak Tibetan; I don’t speak other languages. But I have studied the Buddha’s outer vinaya and inner vajrayana teachings. Especially I have studied the Dzogchen writings of many scholars and yogis. They all say that abstaining from meat is good for longevity. If I consider my own family, there is no one else who has lived beyond 60; all my relatives are dead. But because I left my homeland and abstain from meat and smoking, I am now 93 years old. I can still walk, sit and get around everywhere by car and plane. A few days ago I went to Lhakhang Gon in Helambu, where they are building a new Sherpa monastery. You asked me to talk about the reasons for becoming vegetarian, and what I have told you may be publicized. What I have told you is all true, not a lie. It is based on the Buddhist scriptures, the teachings of the gurus, and on my own experience, not on the words of a few people who claim to be scholars. That is why you should publicize this message. I also rejoice in your virtue. Your actions are definitely virtuous. You should continue your campaign to educate the lay people, and also the ordained people. You should tell it to the lamas and Tulkus who sit on high thrones and think they are important, and also to those of the lowest rank, to the monastic communities and also to the public, to those worldly people in high position with common sense who can reason for themselves and also to those without common sense. This is what I have to say. You have asked this frail old man to speak, so I have told you my heart advice. There is a need for this message and the reasoning to be publicized; there is nothing in this message that should be withheld. This entry was posted on 13131313, in Practices. Bookmark the permalink.